I found this an absolutely fascinating, inspiring tale that truly opened my eyes to one of the planet's scariest phenomena... We hear of endangered wildlife and how our modern industrial society is harming the environment. We hear of other worrying global issues. But, often neglected and hardly publicised, is the very real situation of the reduction in global language diversity. 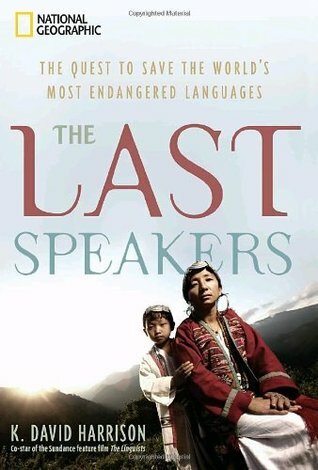 (Minor) languages, often spoken by marginalised tribespeople in remote areas of the Earth, are disappearing into the annals of history (or remaining unrecorded) as they fade into extinction. We are losing human knowledge at a great rate. This knowledge has accumulated over a great period of time and has characteristics which simply cannot be translated or encoded into larger, more powerful global languages. We think that in our modern world, we have an abundance of knowledge and have improved communication. The invention of the internet and spread of the English language as the dominant lingua franca for global business gives us a false sense of arrogance and superiority. The erosion of ancient knowledge makes us poorer as a global human society, however... Harrison elegantly argues the case for the desperate need to preserve and revitalise these strange tongues ion far-flung places. I think that one of his most valid points in the argument for preservation of language diversity, is that these languages contain critical knowledge of local environments, usually in places which are at most risk of tipping the scale in the imbalance of climate change and environmental degradation which has been demonstrated to affect us all, wherever we may live, and whatever our chosen first language might be. The book is intellectual, but accessible. It provokes serious thinking and demonstrates the careful study and hard graft put in by researchers and indeed last speakers of the most critically endangered tongues. I have close links to Wales and New Zealand which are both leading the way in the mass revitalisation of endangered languages, ie. Maori and Welsh... The mass education program in schools in both of these countries clearly demonstrates the cultural value inherent in revitalisation efforts and serves as a model to other language hotspots where the loss of culture, knowledge and language is at its most perilous. As a student of language, who aims to continue his own understanding of linguistic communication on our planet, I would highly recommend this book which I have given a maximum five star-rating. Sign into Goodreads to see if any of your friends have read The Last Speakers.